Newlyweds Jamie Chung and Bryan Greenberg are settling into married life this year! Jamie joked with POPSUGAR, "Now that the deal is sealed, I can go to town on the house!" The pair have been working on creating a home that combines both their interior styles. We were thrilled when Jamie and Bryan enlisted our help as they tackled re-designing their living room space. While Jamie, a SF native, is drawn towards more of a Californian bungalow style, Bryan’s taste is more mid-century craftsmen. Our head of design, Ashley Redmond, perfectly combined the couples style and created a seriously gorgeous living room! Jamie had nothing but positive things to say about us to POPSUGAR exclaiming, "They [Decorist] literally transformed the room to reflect both our styles." Jamie took our easy and fun style quiz to get started. Find out yours! Jamie got started by filling out our questionaire. She took room measurments of the space and uploaded some inspiration photos. Both Jamie and Bryan agreed they wanted to replace their existing sofa, which was brown leather. They wanted to make sure the sofa was still big, comfortable and cozy. Ashley found a beautiful sectional from ATGStores.com that was made for this space! Hanging above the sectional are three bentwood pendant lights (in round, barrel and onion) from West Elm. We love the sleek design and how they add interest without adding weight! 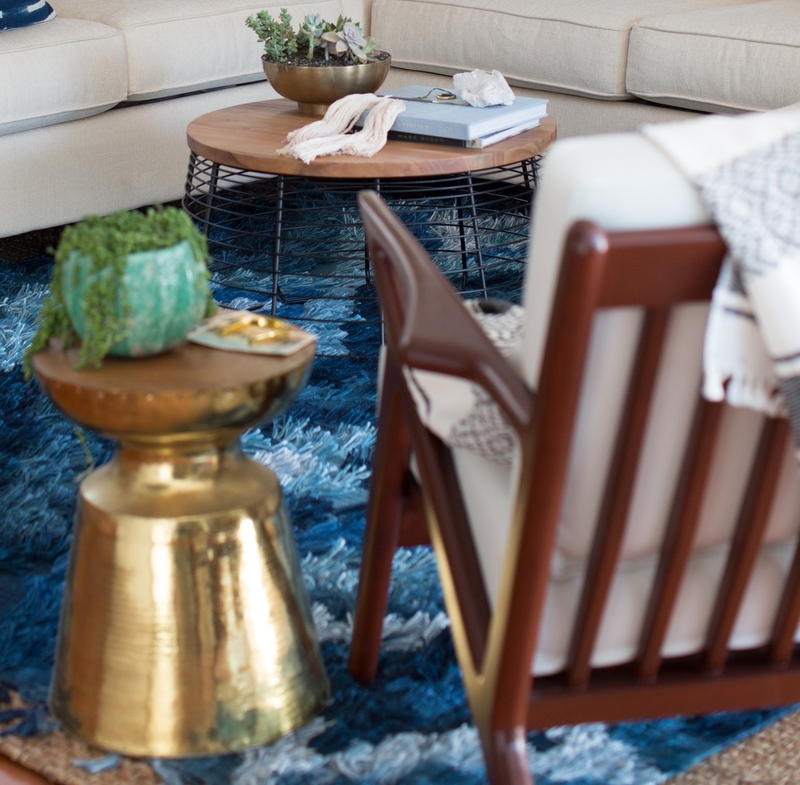 To add color and texture to the room, Ashley selected an indigo rug from Loloi layered on top of a sisal rug. Jamie and her puppy, Ewok, love the Loloi rugs — and we totally see why! The rich hues of blue against the natural sisal rug make the room feel relaxed. Jamie and Bryan already had a chair that worked effortlessly in the new design. Nestled next to the chair is a brass stool by Zuo. This piece is a subtle statement that really elevates the space. Psst...the showstopping Dwight Side Table behind the couch is from Zuo too! The natural wood showcases the plant life and objects for a perfect balance of function and decorative appeal. Jamie and Bryan wanted to add in some plant life, their living room gets exposed to a lot of natural light. Lush green plants are displayed in West Elms’ mid-century turned leg planters. Ashley also included a standing lamp in walnut wood from World Market in their shopping list. What couch would be complete without throw pillows? Ashley found some unique African textiles from Homegirl Collection that complement the couch so well. The indigo, shibori fringed and African Mudcloth pillow covers can seen in the photo below. To cozy up the living room Ashley suggested adding a throw blanket by Accompany. The blanket is fair-trade and handwoven in Mexico! For some finishing touches, Ashley accessorized the living room with Cascade Wall Hanging from Vuela Boutique, vitreluxe glass vases and brass horseshoe from West Elm. Jamie and Bryan could not be happier with their new living room design. We had such a lovely time getting to know the couple and had a blast meeting them in person when we photographed their new space. Get started on your design project today and work with a Decorist online interior designer to transform your space.